Our choices reverberate beyond ourselves: this is a daunting idea that at many times we would rather avoid. Examples abound of people who, choosing what is expedient for them individually rather than what is good for others collectively, deceive themselves and others into thinking they had no choice at all. Nazi officials explain atrocious murder with some version of “I had to do it,” testifying at the Nuremberg Trials that they were only following orders; religious or ideological fanatics cleave so strongly to their causes that they accept their texts as absolute commands; business owners sacrifice worker rights for cheap labor, saying it is their only option to keep up with the competition. The no-choice mindset is a dangerous one to fall into because, hiding from free will through acrobatics of self-deception, we give ourselves permission to act unconscionably. Dante Alighieri’s Inferno, Sophocles’ Antigone, and Simone de Beauvoir’s The Ethics of Ambiguity illustrate why–though we all have the capacity for free will–we are often tempted to deny it, with disastrous consequences. When our selfish desires conflict with the broader good of society, we have incentives to pretend a lack of free will in order to shun responsibility and justify evil. This means we are not truly free until we accept full responsibility for our actions and the ways they shape the world. Dante’s and Sophocles’ literary worlds are both built upon the intertwined existence of free will and responsibility. 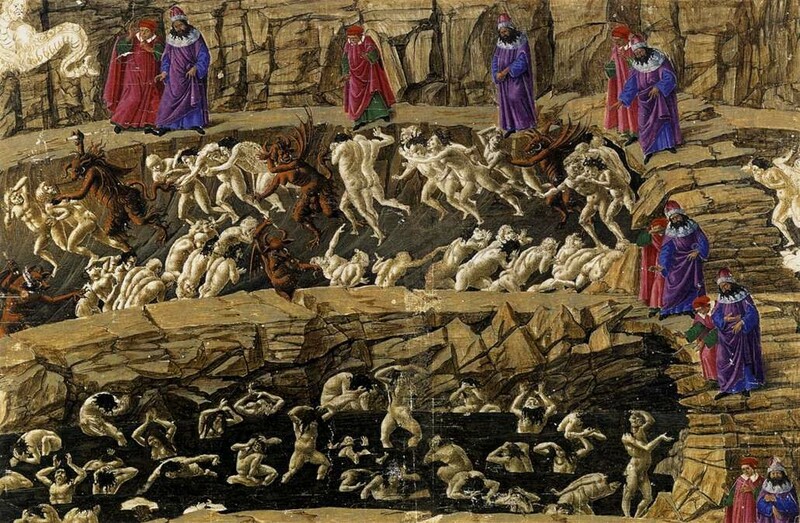 Dante’s fourteenth century epic poem Inferno reflects its era’s Christian worldview of personal sin and redemption. The divine justice of Hell rests on the idea that because men have chosen their actions—and through these, their salvation or damnation—they can face consequences for those choices (Harrison) (see fig. 1). The ancient Greek play Antigone seems to operate on similar principles of individual responsibility and free will, because ultimately it indicts its characters rather than outside influences for their actions. For example, Sophocles frames the proud king Creon’s fall from fortune as self-manufactured and therefore freely chosen. By the end of the play, Creon has called misfortune down upon both himself and the people around him: his son and wife have committed suicide and his country is stricken. Tellingly, a messenger informs Creon after his family’s deaths, “The grief that lies to hand you’ve brought yourself” (1408). Fig. 1: In Botticelli’s painting “Inferno, Canto XVII,” sinners deserve their torments because they chose their fate. From Botticelli, Sandro. “Inferno (Dante).” Wikipedia. Wikipedia, 3 Dec 2015. Web. 8 Nov 2015. The idea of personal agency might seem at odds with Greek tragedy’s emphasis on Fate; traditionally “tragic” characters experience inevitable downfalls predetermined by the Gods (Harrison). However, Fate is compatible with free will in Antigone. The play closes by concluding that “the mighty words of the proud are paid in full / with mighty blows of fate, and at long last / these blows will teach us wisdom” (1468-1470). Fate’s role with regard to Creon is not blind and arbitrary. Instead, the phrase “paid in full” paints Fate as a just distributor of punishment much like Dante’s Hell, delivering retribution in measure befitting the crime. As with Hell, Fate’s logical justice hinges on the presence of free will. Individuals bring the “blows of fate” upon themselves through personal decisions to act immorally, as Creon does when he chooses his pride over reasoned deliberation for the good of his people. In addition, Antigone locates power of choice in the individual rather than outside forces with the words “these blows will teach us wisdom.” Fate may rain down its disapproval, but in the end it is up to the individual to learn from these consequences and, growing wiser, change his behavior. Free will still stands. As modern readers, we may not believe in the existence of Hell or godly Fate, but these devices in Inferno and Antigone give an important lesson in responsibility, with the broader message that in a practical sense each of us has final agency over our actions and, just as important, over the way that we will respond to our actions’ consequences– whether we will learn from them and mature, or like the unrepentant sinners of Inferno simply calcify in our ways. In order to achieve this sort of self-growth we must take ownership of our actions. Unfortunately, sometimes we do not. In her book The Ethics of Ambiguity, the 20th century philosopher Simone de Beauvoir helps us understand why some people deny their agency. De Beauvoir’s chapter “Personal Freedom and Others” describes the different ways in which people hide from their capacity for free will, and the reason why they do so: freedom involves the “anguish” (36) of responsibility for the world around us. De Beauvoir points to the bliss of childhood in which a person’s “whims and faults concern only him. They do not weigh upon the earth. They cannot make a dent in the serene order of a world which existed before him, without him” (36). She also points out the inevitable adolescent crisis that follows, when a person realizes the subjectivity of all that has come before him, handed down as truth, and the intertwined fact that “his acts weigh upon the earth as much as those of other men” (de Beauvoir 39). Here, we see that terrifying freedom—the empowerment to choose our own actions from a mess of subjectivity rather than just follow blindly after what we are told– arrives hand-in-hand with terrifying responsibility, the knowledge that our choices will have real impact. It is no wonder then that we are paralyzed and seek to escape the newfound burden of our free will. We may selfishly seek to shed the burdens of free will while also enjoying its benefits: when useful, we pretend to ourselves and others a lack of freedom that allows us to escape responsibility for the world. Here, Inferno and Antigone provide examples. Guido the sinner and Creon the king both demonstrate how denial of one’s free will enables corrupt and tyrannical behavior. Guido Montefeltro languishes in the 8th Circle of Hell for his fraudulent actions on Earth. Further compounding his fraud, he engages in self-serving deception, rejecting his free will in order to pursue personal gain untethered from a responsibility for his worldly footprint (see fig. 2). Guido plays the “fox” for many years and helps Pope Boniface to lay siege to and raze the entire city of Palestrina (Alighieri 27:75). But rather than display any sincere repentance that would suggest an understanding of personal responsibility for his harmful deeds, he says that Pope Boniface’s “weighty arguments impelled me” and that he would have found salvation “had it not been for the high priest, may evil take / him! who put me back into my first sins” (Alighieri 27:106, 27: 70-71). Guido’s language would transform him into a puppet controlled by Pope Boniface, a blameless vassal of another’s will, but readers understand the dishonesty in this portrayal. As Beauvoir puts it, “the serious man’s dishonesty issues from his being obliged to ceaselessly to renew the denial of this freedom. He chooses to live in an infantile world” (Beauvoir 47). That last sentence can be rephrased as “he chooses to live without choice,” a seemingly paradoxical but accurate statement. Guido’s childlike acceptance of the Pope as an uncontested authority holding the keys to heaven is the decision of a responsible adult who has calculated such action to advance his own interests. Accordingly, Guido brought his own downfall, and only Guido can decide to “ceaselessly renew” his rejection of freedom in each retelling of his story. Fig. 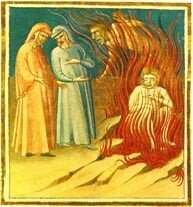 2: Dante and Virgil speak with Guido in the 8th Circle of Hell. From Thomas, Rebecca Shepherd. “Dante’s Inferno Canto XXVII.” Hubpages. Hubpages, 13 Aug 2013. Web. 6 Nov 2015. Creon also justifies tyrannical self-interest by denying his free will, in this case hiding childlike not behind the unquestioned will of another but behind unquestioned values. De Beauvoir describes this as “taking refuge in the ready-made values of the serious world” (44). Creon exhibits many of the “serious” man’s qualities: “He will proclaim certain opinions; he will take shelter behind labels; and to hide his indifference he will readily abandon himself to verbal outbursts or even physical violence” (de Beauvoir 44). Creon sticks rigidly to his decision to punish Polyniece’s burial, citing subjective values of “loyalty to the state” (Sophocles 234) that he has instead accepted as edicts. Just as with Guido, Creon chooses to live without choice. He “pretends that the unconditioned value of the object is being asserted through him” (Beauvoir 49), badly masking his true motive: the outrage that anyone should undermine him. We see this true motive in his speech toward Antigone (“inferior to a woman, never” (Sophocles 759-760)), Haemon (“schooled by a boy his age?” (Sophocles 814)), and most significantly the city (“And is Thebes about to tell me how to rule?” (Sophocles 821)). Creon ignores the fact that he freely chooses each moment to embrace his edict out of selfishness, a desire to assert his power and manhood. And yet, by the end of the play Creon is able to reclaim his free will by recognizing the capacity for choice that he had all along. In a stark reversal, after his son and wife kill themselves and strife descends on Thebes, Creon refers to his “crimes” (Sophocles 1393) and declares, “And the guilt is all mine—can never be fixed on another man, no escape for me. I killed you, I, god help me, I admit it all!” (Sophocles 1441-4) (see fig. 3). Creon’s grief gives his statements sincerity, and readers can imagine that he will act with less self-serving pride and more world-serving reason in the future. He is truly learning from the “blows of Fate,” which can be understood outside the world of Greek tragedy as simply the consequences of our actions. Prompted at last by consequences particularly devastating to him, Creon begins to own up to the connection between his choices and the world around him, or in de Beauvoir’s words to see how his acts “weigh upon the earth.” Antigone shows us that this acceptance of responsibility is crucial if we want to exercise our full capacity for freedom– the freedom to change who we are and what we believe, the freedom to revise ourselves rather than “ceaselessly renew” our lies, the freedom to gain wisdom. By attuning ourselves to the link between our actions and the ripples they create, we can learn how to wield our free will productively rather than destructively, and holistically, for the benefit of many. Fig.3: Mourning his dead son, Creon begins to repent his actions. From Wochniak, Peter. “Approachable Antigone Poses Old Questions but Hints at the Present at Upstream Theater.” Stage Door St. Louis. Stage Door St. Louis, 13 Oct 2014. Web. Nov 6 2015. So yes, we have free will, but what really matters is how well we will use it. Will we avoid free choice in a manner that is dangerously self-serving? Or will we embrace free choice in a way that increases our sense of connection to and ownership over the world, because it is a world covered in our fingerprints, the weight of all our choices? Surprise, surprise- it’s freely up to us. Alighieri, Dante. Inferno. Trans. Robert Durling. Oxford: Oxford UP, 1996. Print. De Beauvoir, Simone. The Ethics of Ambiguity. Trans. Bernard Frechtman. New York: Citadel, 1949. Print. Harrison, Robert. ESF Lecture: The Winds of Freedom. Oct 12 2015. Sophocles. Sophocles: The Three Theban Plays. Trans. Robert Fagles. New York, NY: Quality Paperback Book Club, 1994. Print.